A Western blot analysis of CD14 expression in untreated and LPS stimulated murine RAW264.7 macrophages and NIH/3T3 fibroblasts, β-actin as endogeous control. Transfection efficiency test by determination of GFP-positive RAW264.7 cells by cyto fluorescence 24 hours after transfection with B Xtreme Gene HP, C Xtreme Gene 9 DNA, D Superfect, E Polyfect, and F by β-galactosidase assay, ***: p < 0,05. 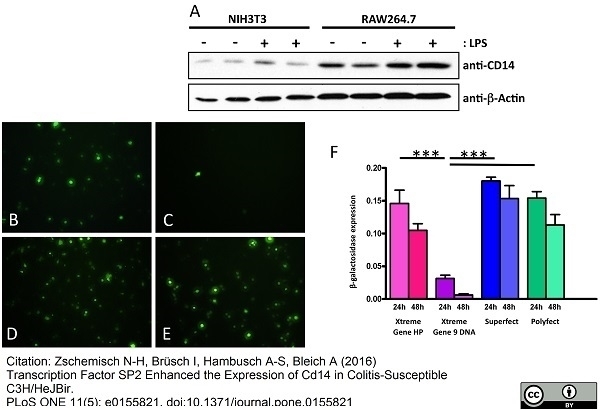 Transcription Factor SP2 Enhanced the Expression of Cd14 in Colitis-Susceptible C3H/HeJBir. Horseradish peroxidase conjugated Rabbit F(ab')2 anti Rat IgG antibody recognizes Rat immunoglobulin G. Sera from rabbits hyperimmunised with highly purified rat IgG was affinity purified on a rat IgG column. Digestion to F(ab')2 with pepsin was then performed, the resulting fragments were conjugated to horseradish peroxidase using the periodate method. Cross reactivity is observed with mouse IgG but may be blocked by the addition of 10% mouse serum. Hampson, G. et al. (2010) Validation of an ELISA for the determination of rituximab pharmacokinetics in clinical trials subjects. J Immunol Methods. 360 (1-2): 30-8. Br J Cancer. 106 (5): 883-8. Gholami, M. et al. (2015) Selenium effect on ischemia-reperfusion injury of gastrocnemius muscle in adult rats. Biol Trace Elem Res. 164 (2): 205-11. Zschemisch NH et al. (2016) Transcription Factor SP2 Enhanced the Expression of Cd14 in Colitis-Susceptible C3H/HeJBir. PLoS One. 11 (5): e0155821.